The size and shape of a USB thumb-drive, DragonFly Red is a digital-to-analog converter with a USB plug at one end and a 3.5mm mini-jack at the opposite end. 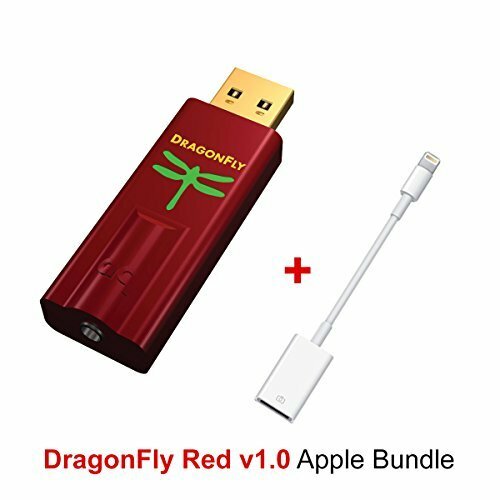 Compatible with Apple OS X and Windows (7, 8.1, 10) PCs, DragonFly Red can be plugged into a USB port to bypass the host computer's compromised audio circuitry and deliver cleaner, clearer, more naturally beautiful sound to headphones, powered speakers, or complete audio systems. Thanks to its low-noise, high-efficiency Microchip microcontroller, DragonFly Red draws extremely low power from the host, enabling seamless compatibility with Apple iOS and Android mobile devices. DragonFly Red requires no additional drivers and plays all digital files-from MP3 to high-res (with native resolutions up to 24 bits and 96kHz). DragonFly Red's 32-bit ESS 9016 DAC chip uses a sophisticated minimum-phase digital filter to provide more naturally detailed and dynamic music, while the bit-perfect digital volume control enables maximum resolution regardless of volume setting: With DragonFly Red connected to a PC or mobile device, adjusting the host's volume control will adjust DF Red's onboard volume. With an output of 2.1 volts, DragonFly Red delivers enough power to successfully drive all preamplifier, integrated amplifier, or receiver inputs, as well as a wide range of today's headphones, including power-hungry models. AudioQuest's free Desktop Device Manager application allows for software upgrades to meet future technological advancements. With DragonFly Red, music lovers can enjoy an emotionally compelling listening experience, at home or on the go, with the computer or mobile device of their choice. Apple bundle includes the Apple Lightning to USB Camera Adapter needed for Apple iOS 5 and newer with the Audioquest DragonFly Red 1.0. This is a true certified Apple adapter. For greater overall performance, the new DragonFly models also incorporate improved 32-bit ESS Sabre DAC chips-the 9010 in Black and the higher-performance 9016 in Red-both of which employ minimum-phase filtering for naturally detailed, more authentic sound. DragonFly Red includes the latest ESS headphone amp and a bit-perfect digital volume control that resides on the 9016 DAC chip itself-a sophisticated implementation that ensures maximum fidelity, dynamic contrast, and signal-to-noise ratio. With its higher 2.1-volt output, DragonFly Red will be compatible with a wider range of headphones, including power-hungry, low-efficiency models. If you have any questions about this product by Audioquest, contact us by completing and submitting the form below. If you are looking for a specif part number, please include it with your message.